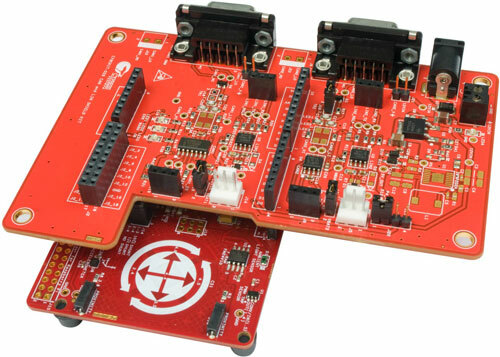 Cypress Semiconductor has introduced a Shield Kit. It enables designers to evaluate the CAN and LIN slave communication capability of Cypress' PSoC and flexible MCU families. The CY8CKIT-026 CAN and LIN Shield Kit features two CAN transceivers for accuracy high-speed transmissions, two LIN transceivers, and Arduino compatible headers. The kit plugs into any Arduino baseboard, enabling it to be used along with all PSoC 4 Pioneer development kits. Additionally, the kit includes five example projects that demonstrate the CAN and LIN capabilities of PSoC 4 (programmable system-on-chip). This kit is intended mainly for automotive applications as well as industrial applications interested in using CAN or LIN as their communication bus. The kit enables designers to create their own projects with CAN and LIN slave components in Cypress's PSoC Creator Integrated Design Environment (IDE) or by altering code examples provided with the kit. The IDE simplifies system design and accelerates time-to-market by enabling concurrent hardware and firmware design. PSoC Creator works with PSoC Components—free embedded ICs represented by an icon in the IDE—to enable rapid prototyping of end applications while minimizing PCB redesigns and firmware changes. "Our new shield kit enables designers to easily evaluate CAN and LIN communication using any Arduino-compatible microcontroller-based kits that support the protocols," said Dr. Jing Mu, Senior Director of Automotive HMI Marketing for Cypress. "Cypress makes this even simpler with the use of our PSoC Pioneer kit, example projects and very-easy-to-configure components in PSoC Creator." The CAN and LIN kit's Arduino-compatible shield board can be used with the company’s CY8CKIT-042 PSoC 4 Pioneer Kit and CY8CKIT-044 PSoC 4 M-Series Pioneer Kit. The kit's CAN code example demonstrates how to send and receive data over the CAN network using a capacitive touch-sensing button implemented with Cypress's Cap Sense technology. The status of the button on the Pioneer Kit is sent using the CAN protocol to control LEDs at the CAN receiver. This code example demonstrates the configuration and use of the CAN Transmit and CAN Receive mailboxes. Five Cap Sense buttons are configured to control the On/Off status, color, and brightness of an RGB LED. This data is transmitted over CAN, and at the CAN receiver, the RGB LED is configured to reflect the received data. The kit's LIN code examples demonstrate the implementation of LIN slave communication in PSoC 4. The LIN component in PSoC 4 supports a LIN slave with both LIN v1.3 and LIN v2.1/2.2 protocol specifications.